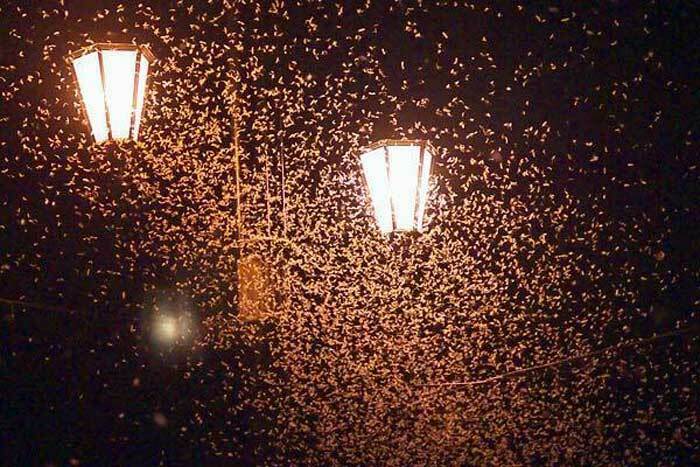 It is predicted that the reason why night insects, such as moths, are attracted to lights is because they mistake them for the light of the moon, which they used to navigate the Earth before mankind made artificial lights. One of the most popular theories holds that positively phototactic insects are drawn to lights because they act like a navigational guide. Many insects find their way by keeping a natural light source, such as the Sun or the Moon, at a constant angle. Unfortunately, when they encounter an artificial light, insects can become confused very easily. They may mistake the artificial light as the Sun or the Moon. Rather than keeping a constant angle with the Sun or the Moon, these insects instead begin to try to keep the artificial light at a constant angle.